Increase attack of all allies by 15% while she's on the field. 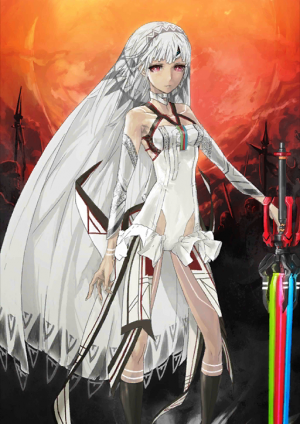 Attila the Hun, a great king who created a great empire. A descendent as well as a warrior of the Hunnu, and its king. The great hero of the 5th century that conquered empires from western Asia to Russia, Eastern Europe, and even Gaul. It is said she brought forth the ruin of the Western Roman Empire. I have loved the God of War, Mars (Ares) since I was born. Posesses superior intuition that does not abandon logic no matter how dire the situation. 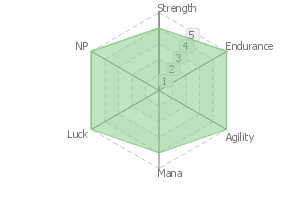 Proud, ideal warrior. Somehow there is something "hollow" about her. In battle, she stays calm, assesses the situation, then turns into a war machine that kills mercilessly. A pure "King of Combat". Compared to her conquests in battle, she fails at politics. After her death her empire quickly crumbled into ruin. However, the name "Attila" instilled fear and awe in everyone, to the point that to this day people remember that name. 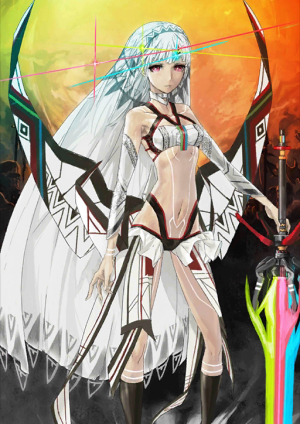 that is what her Noble Phantasm is believed to be. 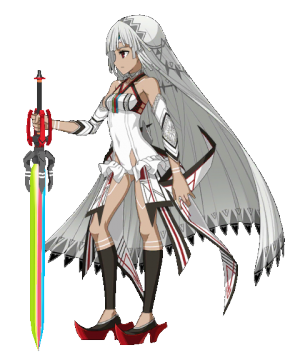 The Noble Phantasm "Photon Ray" is shaped like a longsword, but somehow has a futuristic feel. The "blade" glimmers in three colors, and is able to destroy "any and every existence" in the land. When its true powers are unleashed, its rank and type increases. It would be "to live a life not as a warrior." She does not dislike herself as a warrior, but if she had not been a warrior, how would she have lived? She is curious about that. A great king who established a great empire. Attila the Hun. A descendant of the Xiongnu (Hunnu), she is a warrior and king of the Hun tribe. A great hero from the 5th Century who controlled a vast territory, spanning from West Asia to Russia, Eastern Europe and Gaul. It can be said that he invited the collapse of the Western Roman Empire. Had a liking for the War God Mars (Ares) since she was born. With an outstanding power of intuition, she stands against all circumstances without abandoning her reason. A proud, rational warrior. In some respects, there is an "emptiness" in her. 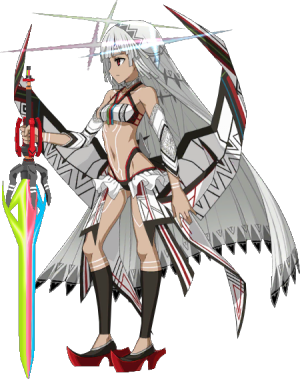 During battles, she turns into a combat machine that calmly, accurately grasps the situation and executes a merciless massacre. Utterly, a "Combat King". In contrast with the deeds of arms in the battlefield, she was not successful in her reign and the empire quickly collapsed after her death, vanishing completely. However, the name "Attila" that exemplifies awe and fear is being remembered by the people even to this day. 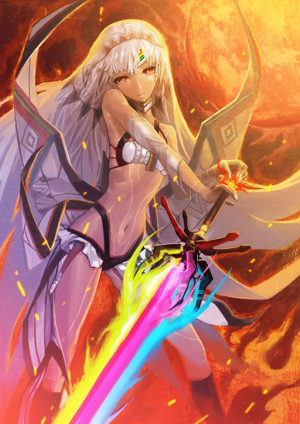 A Noble Phantasm that put together the valor and fear that awed all European nation as the Scourge of God or Divine Reprimand, and the anecdotes of having acquired the sword of the Mars... or so it is thought. 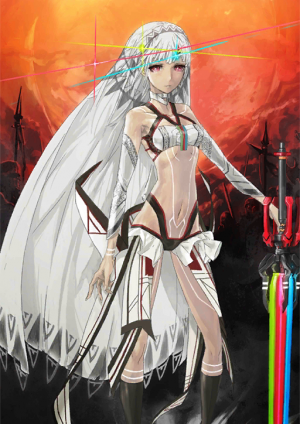 The Noble Phantasm Sword of the War God has the shape of a long sword but, for some reason, its design somehow gives a futuristic impression. 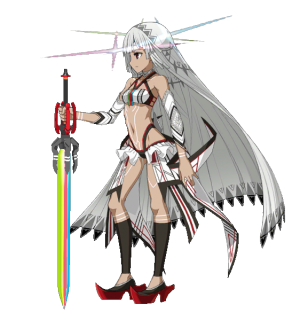 The blade composed of three-colored light is said to be able to destroy any and all existences in the world. Once its true power is released, both Rank and classification rise up. 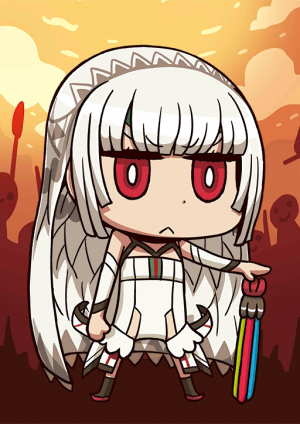 If she were to have a wish for the Holy Grail--it would be "I want to try living a life other than that of a warrior".By no means she felt disgusted with her warrior self. Just, if I were not a warrior, what sort of life would I lead - she is holding such curiosity. This page was last modified on 30 December 2018, at 10:30.